The Falcons' Aiden Maloney returns a punt for a touchdown with 1:21 remaining to secure conference win. Big time players make big time plays. 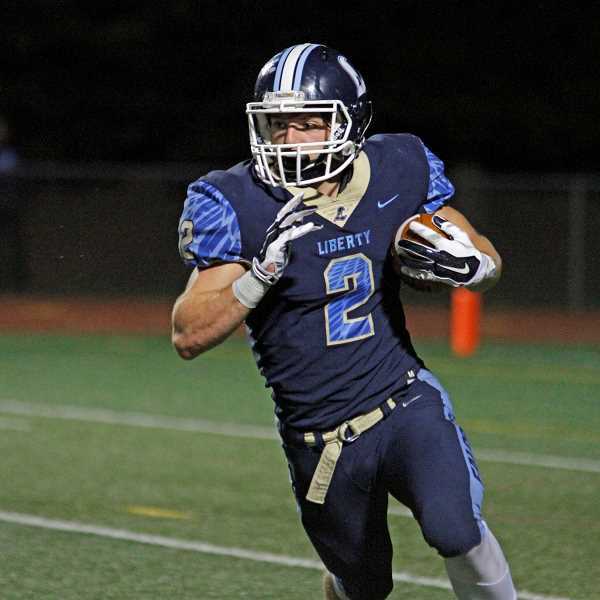 I'd heard that before tonight, but I heard it again after Liberty's game with Sherwood and in this case, that player was Aidan Maloney and that play was a fourth quarter punt return that led to a Falcon victory. Liberty, in a matchup of Pacific Conference unbeatens, defeated the Sherwood Bowmen 40-33, Oct. 19, at Liberty High School, and positioned themselves to win the conference with a win over McMinnville next Friday. The Falcons, who trailed 33-27 with 5:56 left in the game, tied the game and later won it when Maloney returned a Sherwood punt 70 yards for a touchdown with 1:21 remaining in the fourth quarter, then intercepted a Bowmen pass on Sherwood's ensuing possession to put a bow on what was a very sweet win for Liberty football. "I'm feeling great for the whole community," said Liberty head coach Eric Mahlum. "To all these kids and people who support us, to see us win a game like this against such an incredible program, just feels really good." After one of Liberty's few second half defensive stops with 1:21 to play, the Bowmen punted to Maloney who bobbled and then dropped the ball before slowly picking it up and scanning the field. 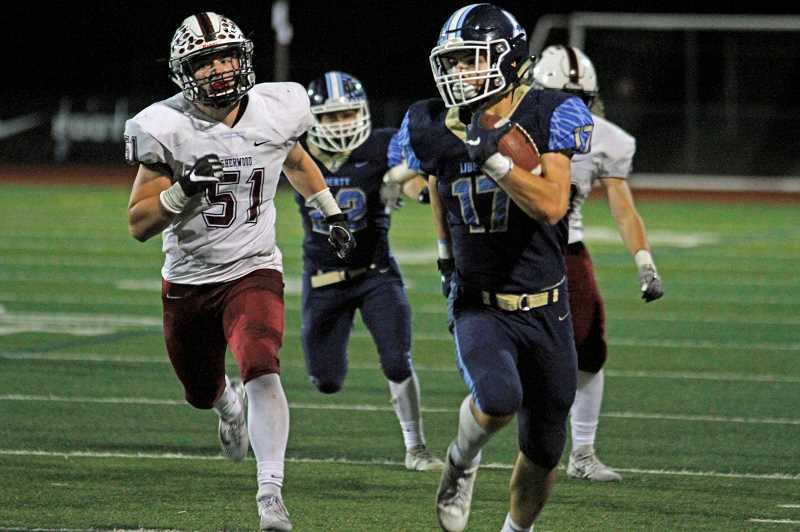 With the Sherwood defenders quickly bearing down on the senior running back, Maloney darted to his left and headed for the sideline where a convoy of blockers were setting up what would ultimately be the game winning touchdown. "Big time players make big time plays," said Mahlum. "He bobbled it, and when most players do that they're in trouble, but it gave him an opportunity to scan the field and it allowed things to develop, and he did what he does." Maloney was a bit more humble about his performance than his coach, but spoke glowingly of his teammates' part in the game-winning play. "Honestly, the biggest thing was getting the ball secure, and I didn't really do that at first," Maloney said with a chuckle. "But when I looked up and saw the guys blocking, I kind of knew it was there. The guys really came through blocking." The Falcons jumped on Sherwood early, building a 14-0 lead on two Bradley Norman touchdown runs just five minutes into the game. Sherwood however closed the gap to 14-6, then after a Bryan Bafaro 10-yard touchdown run made it 20-6, the Bowmen pulled within 20-13 as the two teams headed for the halftime break. Sherwood milked nearly eight minutes off the clock to open the second half, using primarily a combination of Ian Stormont and Clay Peden runs, prior to a Caleb Hagan four yard score that cut the lead to 20-19 following a failed extra point attempt. Liberty quickly regained control of the game on their next possession after a series of Maloney and quarterback Bradley Norman runs, before a second Bafaro touchdown followed by one of the game's few successful extra points put the Falcons ahead 27-19 with 1:22 left in the third quarter. Things appeared to be headed towards a comfortable Liberty win on Sherwood's next possession, as the Falcons defense put a somewhat pass-challenged Bowmen offense in a third and long. But faced with an uphill down and distance, Sherwood pulled a rabbit from beneath their proverbial hat when they ran a successful reverse pass to Jamison Guerra for 60 yards to the Liberty 14-yard line. Two plays later Stormont — who finished with 174 yards on 25 carries — scored from five yards out and following a successful two-point conversion, the game was tied 27-27. After a Liberty three-and-out, Sherwood took their first lead of the night when Stormont capped an 8-play, 73 yard drive with a 20 yard TD run. The extra point was blocked, and the Bowmen led 33-27 with just 5:56 left in regulation. Falcons junior Jaxson Lake returned the ensuing kickoff to near midfield, but a block-in-the-back penalty wiped-out the long return and set Liberty up at their own 16 yard line with a long field in front of them to tie or take the lead. A prospect that didn't faze Mahlum, who trusts in his senior and three-year-starting quarterback. "We have complete confidence in Brad," the coach said. "I told him it's first and ten, let's go. We had a lot of confidence he'd move us down." And he did. Norman converted on third down with a 19 yard pass to Nic Reitzug, then scored three plays later when Norman scampered 41 yards to tie the game 33-33. The ensuing extra point was missed, but the Falcons defense stepped up on Sherwood's next possession, forcing a punt and setting up what would ultimately be Maloney's game winning return. "Such a great team win," said Maloney. "The guys came together all week, believed the whole game and came through with the win for the school and community. I just can't put into words how good this feels." It felt equally good to Mahlum, due primarily to his respect for Sherwood and their program. 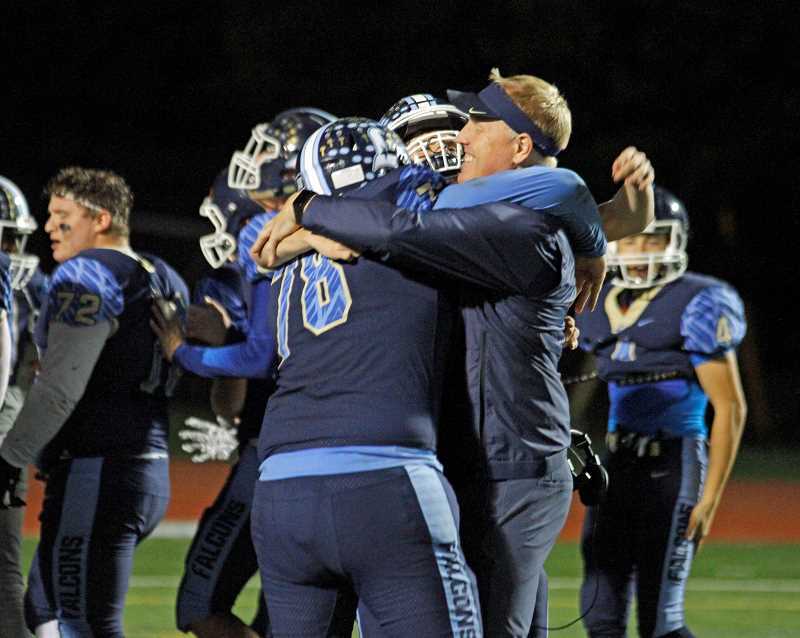 "It feels great because they're a great team," the coach said about Sherwood. "It's a playoff game and a championship game every time you play them. You know when you beat Sherwood you've beaten a top-rate team." But also based on the coach's connection to this senior class. "I've been watching these guys since they were knee high in our youth program," said Mahlum. "This senior class is resilient and they won't quit until it's over. They play for 48 minutes and believe in each other." And how did Norman feel after about the win? "It's a great payoff," said the quarterback. "There's nothing that compares to seeing your hard work payoff, and I'm truly honored to be a part of such a great team and moment." Liberty's game with McMinnville, Oct. 26, is scheduled for 7:00 P.M. at McMinnville High School.